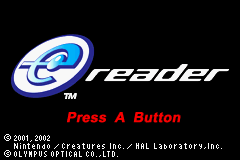 The e-Reader was a card-powered Game Boy Advance add-on that let users scan dot codes to play classic NES games, mini-games in Mario Party-e, get info and play mini-games from Pokémon-e cards, and access some fun stuff in various Game Boy Advance and GameCube games. e-Readers came bundled with two packs: an NES game (either Donkey Kong Jr. or Pinball), and a "sample pack" of Manhole-e, an Animal Crossing-e card, and three Pokémon-e cards (Machop, Machoke, and Machamp). Unfortunately, the e-Reader failed in North America, resulting in a planned "Game & Watch-e Collection" line being shelved (scans of the released promotional material can be seen here). That said, the e-Reader did flourish in Japan, being supported until the end of the handheld's lifespan. Europe never even got the thing. There are tons of unused songs within the BIOS since the Animal Crossing-e cards, Mario Party-e mini-games, and Pokémon-e cards don't contain their own music. GameShark code 02029436???? (where "????" is the song number) will play any song anywhere. For the game "Balloon Burst," an early version of the Wario balloon is loaded into VRAM alongside the used one. This unused version is one pixel smaller on all sides, and has a less tense expression. I think I saw some debugging symbols, too. I'll have to double-check that. As well, is there a saved application for this "CardeStd Test" preloaded on the e-Reader? Present at offset 0x5F378C in the NA ROM is this line of text, presumably some unused debugging text. A short signature tune of Kazumi Totaka's, this tune is hidden in almost every game which he has composed music for. In this case, getting the song to play is rather obscure and requires one of two specific cards from the Animal Crossing-e series: more specifically, card P-13 or P-15 of Series 4, both of which contain the minigame "Who's Dunnit? ", where the background music contains Totaka's Song on a loop. As is customary with most e-Reader applications, most assets, including the audio, are stored on the e-Reader unit. This page was last modified on 30 March 2019, at 12:18.